As the earthquake occured in Japan, lots of Chinese gloated over it. bringing severe pain to the people living in those countries. However, it was the fault of their ancestors, but not those living nowadays. This. I've been risen in China, and I have to say until the year I was 12 I hated Japan very much, and I kept claiming that being a REAL Chinese means hating everything that has anything related to Japan. But I changed my mind when I understood that. That's truly Chinese education's fault that all the little Chinese nowadays keep thinking this way. We are family when facing disasters!!! Ooooh yes, THAt girl and her facebook message... What happen to her? It wasn't just 1 girl~ It was a bunch of people! You can't say so bad. Cause tts reason is so confusion. 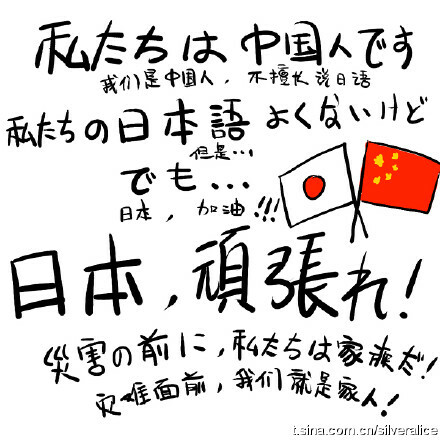 in this years,a large amount of Chinese have changed the attitude to Japanese. I believe someday the matter will be solved.